Designed for America’s History, Eighth Edition, this two-volume primary-source reader offers a chorus of voices from the past carefully selected to enrich the study of U.S. history. 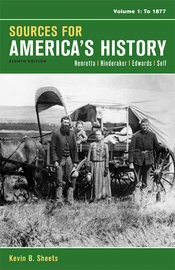 Five to six documents per chapter, ranging from speeches and political cartoons by celebrated historical figures to personal letters and diary entries by ordinary people, foster historical thinking skills while putting a human face on America’s diverse history. To support the structure of the parent text, unique part document sets at the end of each part present sources that illustrate the major themes of each section. Brief introductions place each document in historical context, and questions for analysis help students practice historical thinking skills and link individual sources to larger themes.